He is right. But there is more than one person entombed in the stately building. Our tour guide quickly let us know what the children were chattering about. “There are two people buried in the building and two in the lawn,” she said. But the building is an impressive place for reasons other than that. Construction on the Greek Revival-style building began in 1845 and was completed in 1859. Its architect, William Strickland of Philadelphia, began his career as an apprentice to Benjamin Latrobe, architect of the U.S. Capitol in Washington, D.C. They chose the highest hill in downtown Nashville. Legend says that the property’s owner, Judge George Washington Campbell, acquired it in 1811 as part payment of a debt for a cow. “The Capitol is one of only a few in the nation still in use today,” our guide said, adding that tours are free during the week. The building houses the Governor’s offices, the Chambers of the State Senate, House of Representatives and Constitutional Officers. On Legislature meeting days, visitors can view the Senate and House from their galleries, accessed by the second-floor stairwells. When Strickland died in 1854 before the Capitol was finished, he was buried in the northeast wall of the building near the north entrance – as he had requested. The structure was made of hewn stone quarried nearby. It was modeled after a Greek Ionic temple and stands 236 feet long, 109 feet wide and 206 feet from the ground to the tower top. The Portico at each end resembles the Erectheum in Athens and the tower is patterned after the monument of Lysicrates in Athens. The rafters of the roof are of wrought iron. Rainwater is conveyed from the gutters of the roof by means of cast iron pipes, eight inches in diameter, buried in the walls. The building is still heated with furnaces using hot air flues within the walls. When it was completed, it was one of the most magnificent public buildings of its time. Then the Civil War broke out. 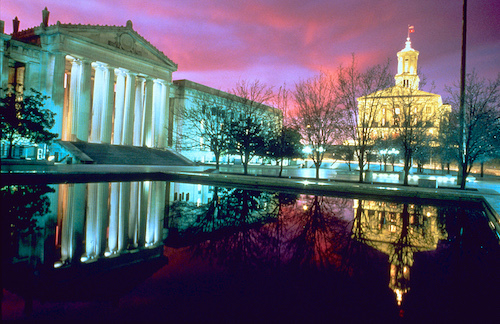 During the Union occupation of Nashville (1862-1865), the Capitol was transformed into Fortress Andrew Johnson. The artillery located there never had to be fired in battle but was used for drills and celebrations. Early photographs from that period show many soldiers perched on the roof. Another reminder of the War Between the States is located halfway up the first flight of stairs on the right. A chip in the handrail is a scar from a bullet fired from the stairs above during a particularly bitter fight in the legislature over the ratification of the 14th Amendment in 1866. The amendment, which granted citizenship to African Americans, was opposed by many in the General Assembly. The guards’ willingness to shoot made them abandon that strategy and the amendment passed. Therefore, Tennessee became the first Confederate state to be re-admitted to the Union. The Capitol is also filled with historic portraits, murals, ceiling frescos and original gasoliers, chandeliers which were converted from gas to electricity around 1895. First floor offices have period carpeting, draperies, some antique furniture and accent pieces. One office also contains photos of Memphis resident Elvis Presley when he was honored by the Legislature. 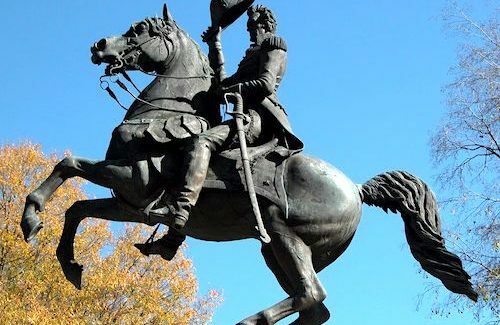 On the east side of the building is a large statue of Andrew Jackson on horseback. If it looks familiar, it is because it’s the same as one in Jackson Square in New Orleans. The one in Nashville is the first of three casts of “Old Hickory,” the original designed by sculptor Clark Mills and erected in 1880. On the north side of the lawn is the tomb of President James K. Polk and his wife Sarah. It was designed by William Strickland and was originally erected on the grounds of their home, near the corner of Seventh Avenue North and Union Street. The tomb was moved to its current location after Sarah’s death in the 1890s. By the 1950s, the exterior limestone of the building was so badly deteriorated that large pieces began to fall, endangering the public. “They used Indiana limestone to repair it,” our guide said. The exterior stone which is brown colored is the Indiana limestone; the gray colored stone in the original. And the fourth grave? Samuel Morgan is buried there. 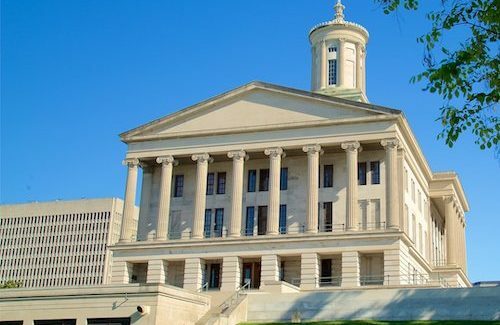 If the name isn’t familiar, Morgan was a Nashville businessman who served as chairman of the Capitol Building Commission when the Capitol was being built. When legislators, worried about the rising cost of the construction, tried to cut back on expenses, such as substituting wood for the marble in the hallways, Morgan led the fight to keep the grand and enduring materials. He died June 10, 1880, and is buried in a corner wall of the State Capitol.